They say the kitchen is the heart of the home. It’s where we hang out, where stories are told, bread is broken and family and friends are gathered. 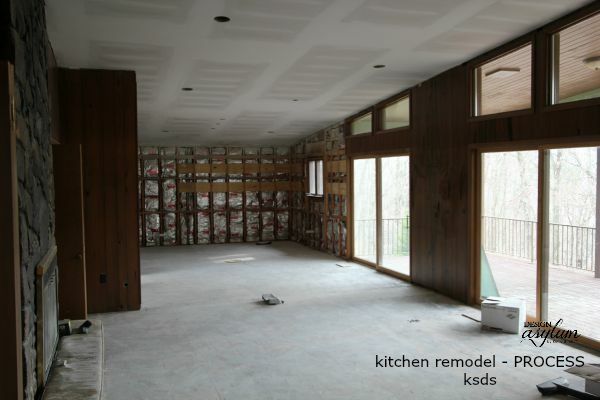 Here’s my journey of a kitchen remodel. As you know, Casa de Loco was a complete gut and remodel. You can read about the master bath and living room, which I previously posted. The house has wonderful bones. It’s my favorite style of home, mid-century modern. The family that built the house, in the early 70’s, had an incredible vision. 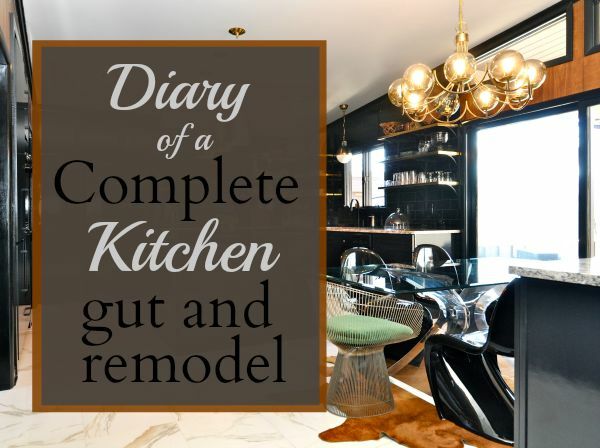 My vision was different, but it was important to me that I stay true to the style, that´s why I went to this kitchen remodel show to get some brilliant ideas. I always tell my clients to treat the house as a client too. Let the house have a voice. The breakfast area was divided off from the den with a bar. Two recessed alcoves were on the left of the kitchen, one was cabinetry and one was a desk. Double ovens were on the wall that separated the breakfast room and the kitchen, with a pass-through. The kitchen felt really small due to the layout. I wanted to open all of that up, so we removed the dividing wall in order to reconfigure the appliance layout and add an island, which was really important for me. So we removed it all. This photo was taken about two months after we began. 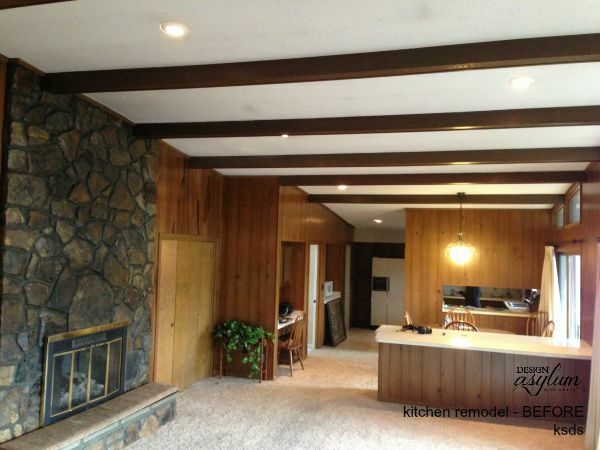 You will notice the popcorn ceiling is gone, as are the beams that you could see in the first photo. The beams ran through out the den. I debated on keeping them, which meant we would have had to add one where the original kitchen wall was, but it was too much visually. I wanted a cleaner aesthetic. We gutted the ceiling and added new insulation, then added new sheetrock. We also added more canned lighting where needed, and planned for lighting above the island. As a side note, if you do not want to go to the trouble and mess of removing popcorn ceilings, you can always sheetrock over them. The next big decision I had to make was in regard to the paneling. This picture is shot from the kitchen into the den. You see that it is fully paneled. It’s a lot of wood. 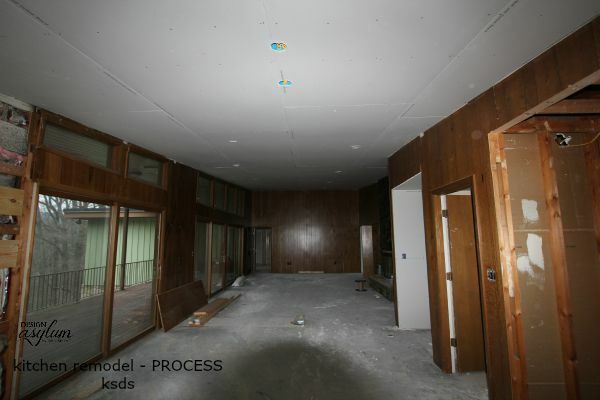 You also notice that the paneling sheets go all the way to the ceiling without being pieced vertically. It is a full sheet floor to ceiling and the ceiling height at the end of the den is at 12 foot. What you cannot see in this picture is that the black knots in the paneling run the entire space. What this all means is that this paneling was specifically cut for this room, I suppose from one tree. I felt a huge responsibility to keep the paneling in tact. But I wasn’t sure I could. I thought about it a lot. The BHE liked it. 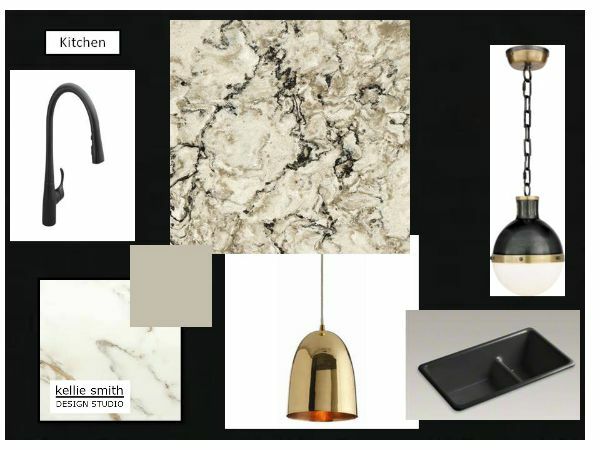 And all of this thinking led me to design a black kitchen. I decided to embrace the paneling and make it work for me. In order to do this, the first thing I decided to do was to accent the black knots in the wood and pull them out by painting the trim black. 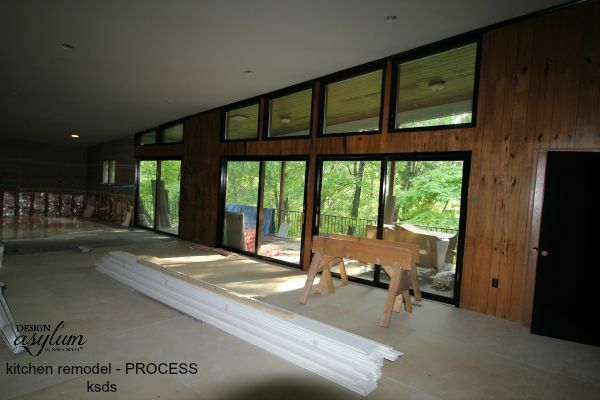 All the trim in the house went black, as did the doors, with the exception of the master suite. I used Sherwin-Williams 6258 Tricorn Black. 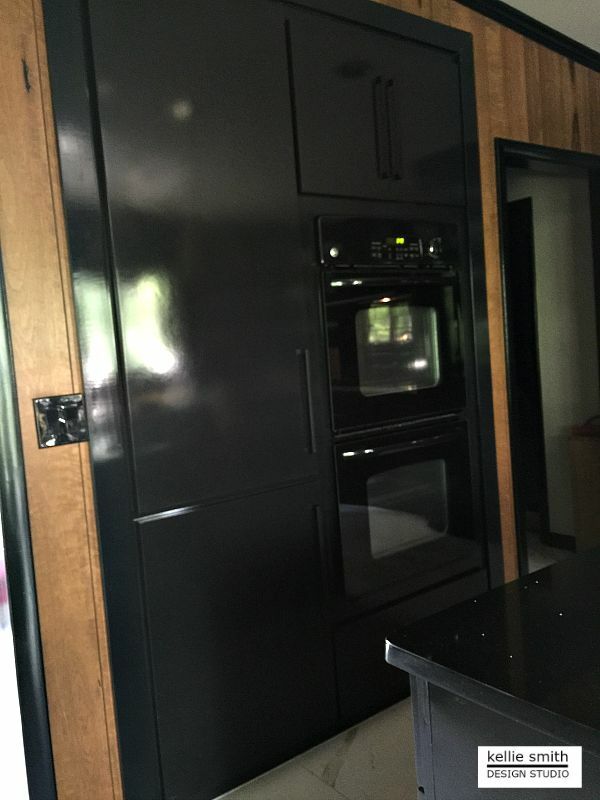 I needed to balance the visual weight of all of the paneling from the den, into the kitchen, so it was important to have a lot of black for depth. It was also important to balance the textures in the space. All of the paneling and the rock fireplace added up to a very ‘heavy’ feel for me. Those surfaces are very ‘flat’ in texture. In order to contrast that, I needed ‘shine’. Now nothing is prettier with black than Calcutta Gold marble. And it’s shiny, which I needed. 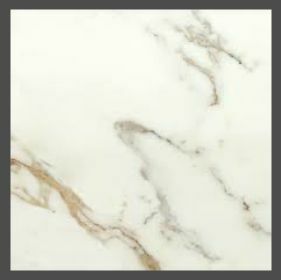 So I chose Porcelanosa Calcutta Gold digital print 18″ x 18″ tiles for the flooring. I also brought that into the dining room, living room and foyer, which is on the front side of the house. Once I had those couple of decisions made, I was able to pull an entire schematic for the space together. 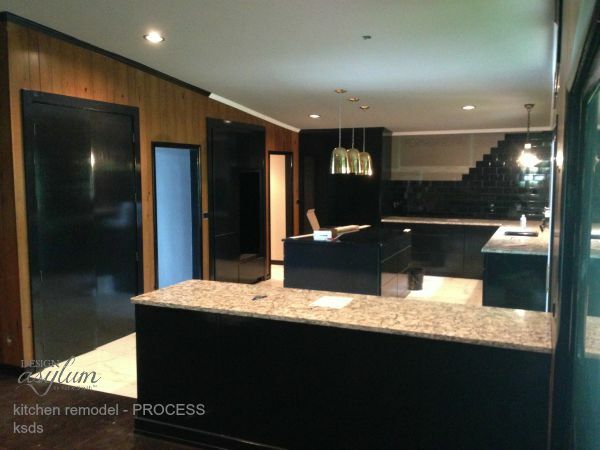 Walls, lighting, cabinet finish, counter tops…the vision was forming in my mind. Yes, the vision is coming together at this point for me. In this picture you can see that the flooring is going down in the kitchen, the trim is now black and the ceiling is painted. Our AC have been broken for some time, now its a good time to get it fixed, AC repair services in the Orlando area helped us out. For the ceiling I used Sherwin-Williams Anonymous Gray, which is an accent color in the flooring. A local cabinet shop build the cabinetry. We selected slab doors and drawers, very plain. I used the same black as the trim, Tricorn, and had the finish done in high gloss, again to bring in a shiny finish. 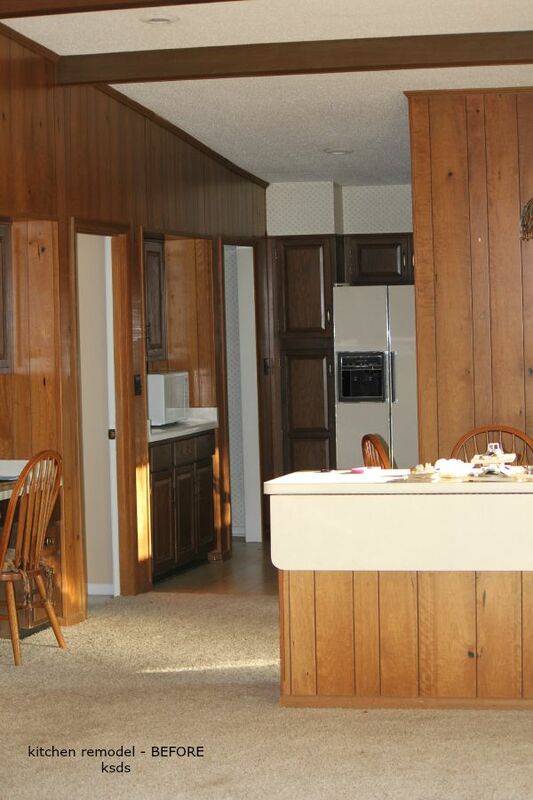 Do you notice there are no upper cabinets? The bar went back into the original footprint. You can see the black knots and pattern in the paneling in this shot. The black trim really pulls that out. We are six months into the renovation at this point. 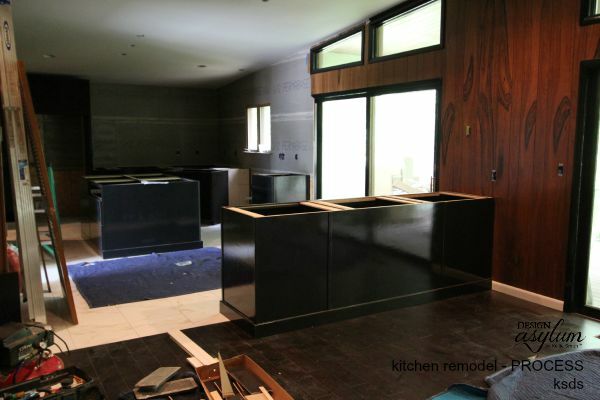 The counters are Cambria Bellingham and Cambria Black. 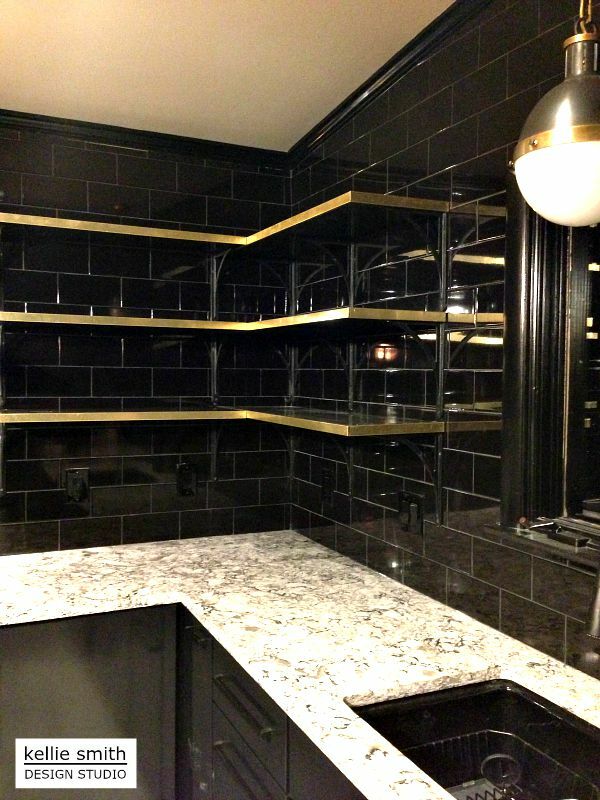 The tile is black subway in the 4″ x 8″ size, with black grout. Since we removed the wall between the dining room and the breakfast area, we had to reposition the double ovens, as that is where they were. We gutted the alcoves up from 7′ openings to 8.5′ openings and used one for the ovens. 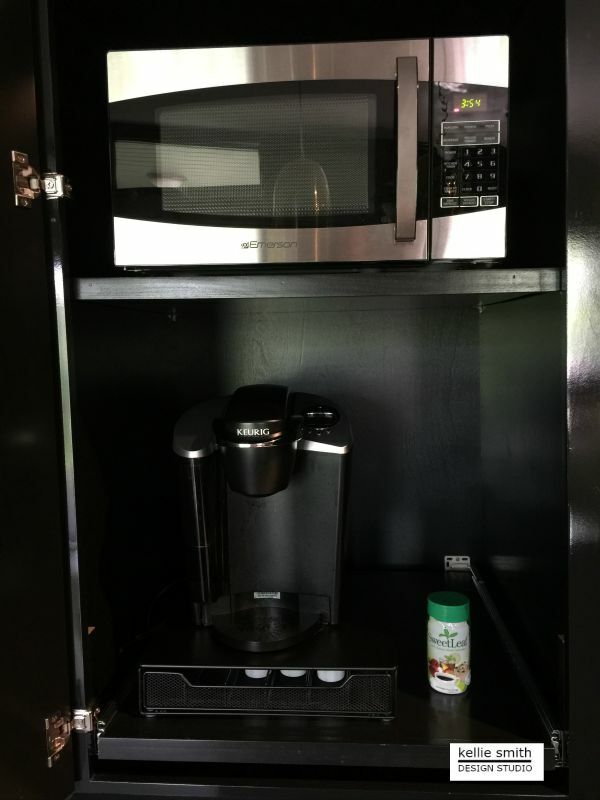 I also added a coffee center, hid the microwave and created a ton of storage for pans and cooking trays, in that space. The coffee maker is on a pull out slab, like a keyboard holder on a desk, which makes filling the water tank very convenient. I mainly did drawers in my base cabinets, but where there are doors, there are roll-out shelves inside. Drawers and roll-outs provide much better storage options than lower cabinets with shelves. The other alcove was converted to a pantry closet. We ordered the doors in raw and the cabinet builders applied the finish to the doors and the trim, so they would like the cabinets. We could have never painted the finish as smooth as the spray application the cabinet makers use. Now, back to the upper cabinets. It took me quite a while to decided on this. Upper cabinets or open shelves? Obviously I went with open, but why? All of my our china is either solid white or clear glass, so I knew it would ‘display’ well. The thought of having upper cabinets just felt heavy. If I decided I wasn’t happy in a few years, I could add the cabinets. I saw a design opportunity. I really contemplated using acrylic for the shelves. How cool would that be? In the end I was concerned the dishes would look like they were floating, so I went with black wooden shelves. The cabinet makers, again, helped me out and applied the finish. To create the brass banding I ordered a brass sheet from an online seller, Online Metals. I took the shelves and the metal to a local metal fabricator and he took over from there. He cut the pieces and braked the metal so that there is a half inch lip on top and bottom of the shelf. In other words, he created a “U”. We simply glued them in place. I don’t think I have $150 in the project but, for me, it’s a big bang for the buck. The shelving brackets came from Van Dykes. Lighting is from Circa Lighting and Arteriors Home. In the end, the kitchen came together nicely. 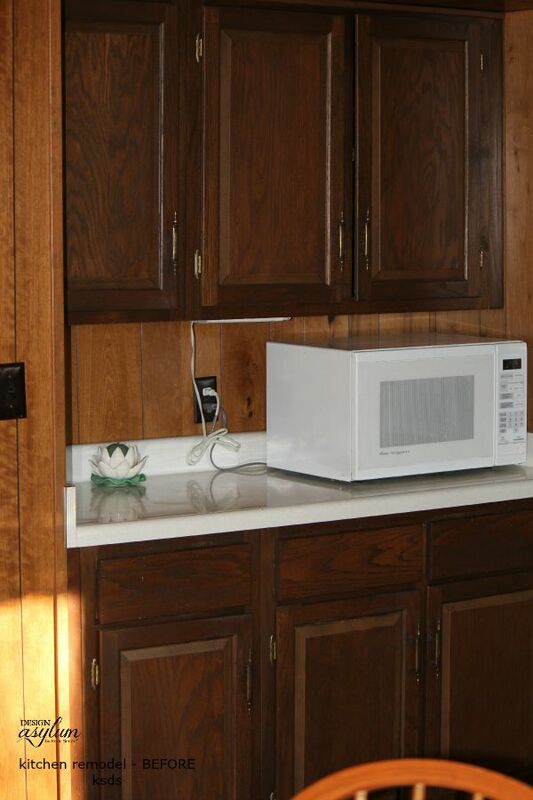 It works great with the paneling, which I am really happy we kept. Are you planning a remodel of any type soon? Would love to know what you’re up to! How To Be Sentimental and Not Be A Hoarder! I wish I had a kitchen like this!! I know a great designer you could hire! Lol!! Absolutely love the risks you took here–could have played it safe and removed the paneling–done uppers–this just WORKS. The vision is amazing. We so need to do something with ours, hoping this will give me some inspiration!! Meg, thank you so, so much for the kind words. I do love the way the kitchen turned out! I hope you are inspired! 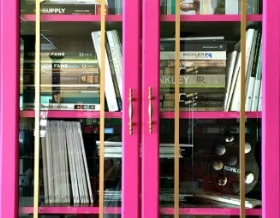 And remember if you want to repaint your cabinetry, check out the kitchen post I did last week using Velvet Finishes. It looks fantastic!! The kitchen looks phenomenal! You must be so happy! Thank you Amanda! We are enjoying the new kitchen. Cooking doesn’t hurt as much now! Lol!! Thanks so much for stopping by! My jaw dropped- this kitchen is bananas! I love, love, love it! And I pinned the daylight a out of it! 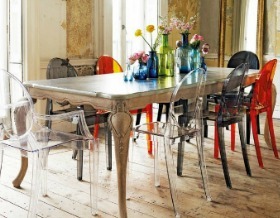 We are definitely planning to gut and rehab our kitchen, as it doesn’t work for us. Thanks for the inspiration! Awww, thank you Kate!! I appreciate the kind words! I hope your remodel goes well, glad to be included in your inspirations! Thanks so much for stopping by! Wow! This is an incredible transformation! 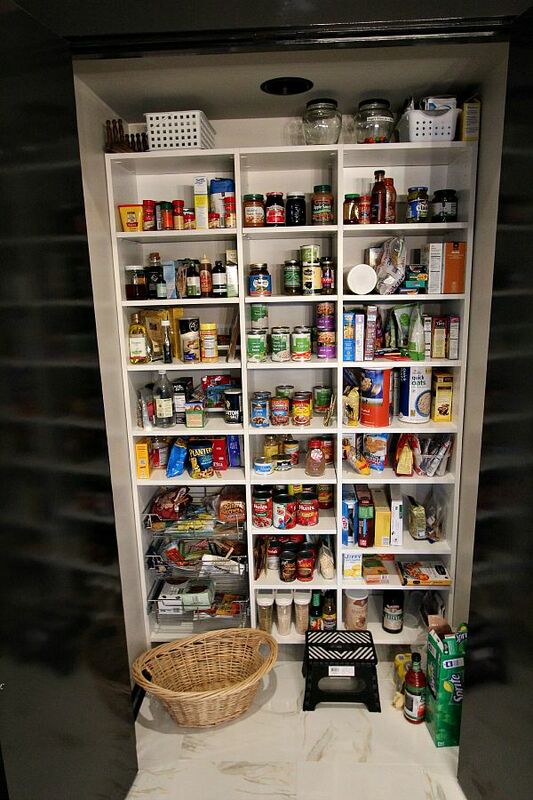 I am so jealous of your new pantry! Awww, thank you Shannon! I do enjoy cooking a little more now! Lol!! Thank so much for stopping by. Wow! I am a sucker for a black/white/gold combo and this is awesome! Thank you Erin! Cooking doesn’t hurt so bad now!! Lol!! Thanks so much for stopping by! I feel like you should’ve gone with acrylic shelves. I can see why you wouldn’t want the dishes to look like they were floating. However, I think that they would look cool. It would make the kitchen unique. Aww Great great design of kitchen, it looks fantastic. WOW! KELLIE you are a good designer . Outdoor Kitchens recently posted…These 6 Scenic Train Rides In Colorado Are Out Of This World! Hi Linda! 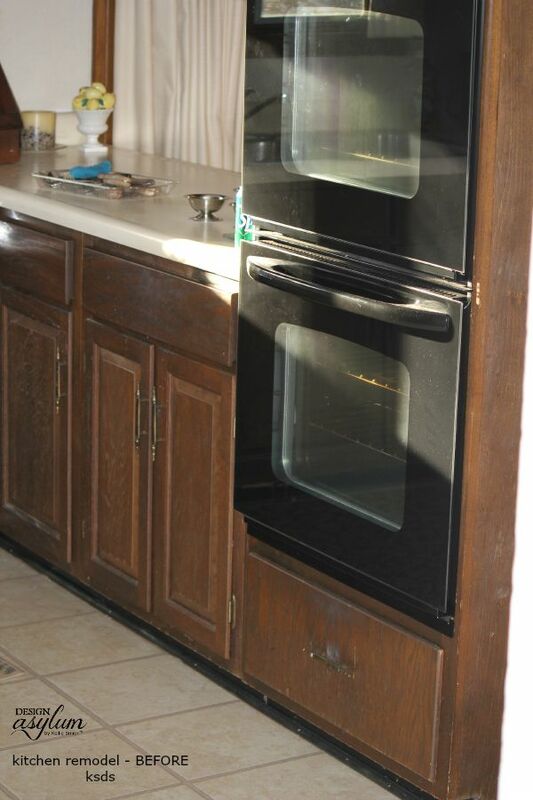 We have a home built in 1956 with original metal Youngstown cabinets. 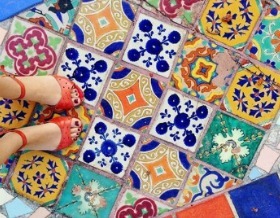 I am looking for an inexpensive way to paint them. Will this work on metal? Thank you! Your kitchen looks fabulous 🙂 I will implement this design in my kitchen too. Metal finishing is the great choice to create transformation. Thank you Ruben! I think the brass just sets off the space. It was a lot of look for little effort and money! Thanks so much for stopping by! Your suggestions for letting the space have a voice really bring the point home that each room has its own personality. You did a great job with the color choice and I can see how your vision came to life.